myodalisque: Flickr Find: Incredible Printmaker! 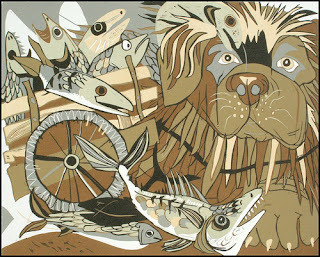 Woodcut print by Jenny Pope. These prints are too incredible. She prints in reductive woodcut, similar to the style I used on my bee and dead bird prints. I don't know much about her, but some e-sleuthing linked me to her profile page on the Ithaca Fine Chocolates Art Bar website. Check out more of her work on her flickr page.